Russo-French author and translator; born at Horodetz, near Kobrin, government of Grodno, June 6, 1818; died in London May 27, 1893. His father, R. Asher Ẓebi, like his grandfather R. Israel, was rabbi of Horodetz; and Rabbinowicz received the usual rabbinical education. In 1828 the elder Rabbinowicz became rabbi of the neighboring city of Antopol; and there the son grew up and became noted as a clever Talmudist. He pursued his rabbinical studies in Grodno and Brest, and afterward studied Greek and Latin at Breslau, subsequently entering the university of that city, where he studied philology and medicine. In 1854 he went to Paris to finish his medical studies, and for several years acted as "interne des hôpitaux" in that city. He received his degree of M.D. in 1865, but never took up the practise of medicine seriously, being too much absorbed in theoretical studies and in the preparation of his works. Rabbinowicz's fame rests on his translations of parts of the Talmud. His "Législation Civile du Talmud," a translation of entire tractates and parts of tractates of the Babylonian Talmud, with introductions, critical commentaries, etc., comprises five large volumes (Paris, 1873-80). His "Législation Criminelle du Talmud" (ib. 1876), critical translations of the tractates Sanhedrin, Makkot, and part of 'Eduyot, was published by the French government. He wrote also "La Médecine du Talmud" and "Principe Talmudique de Schehitah et de Terepha au Point de Vue Médicinal" (ib. 1877; German edition Frankfort-on-the-Main, 1886). 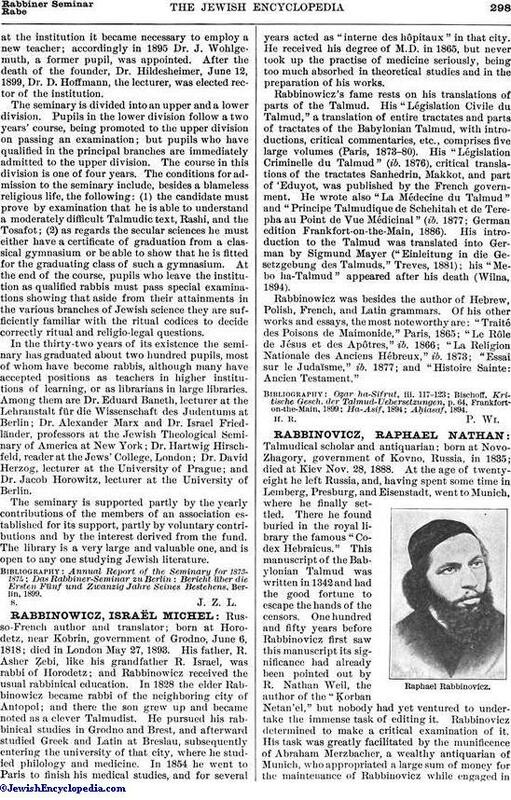 His introduction to the Talmud was translated into German by Sigmund Mayer ("Einleitung in die Gesetzgebung des Talmuds," Treves, 1881); his "Mebo ha-Talmud" appeared after his death (Wilna, 1894). Rabbinowicz was besides the author of Hebrew, Polish, French, and Latin grammars. Of his other works and essays, the most noteworthy are: "Traité des Poisons de Maimonide," Paris, 1865; "Le Rôle de Jésus et des Apôtres," ib. 1866; "La Religion Nationale des Anciens Hébreux," ib. 1873; "Essai sur le Judaïsme," ib. 1877; and "Histoire Sainte: Ancien Testament."